Have you always wanted to include the Ravnos into your Requiem game? Or perhaps the Invictus into your Masquerade game? 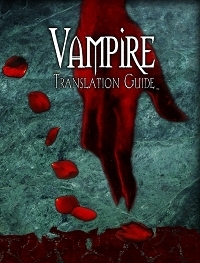 This guide will help you translate the feel and core elements from each version of Vampire into the other game system and background. A copy of Vampire: The Masquerade Revised Edition, the World of Darkness core rulebook, and Vampire: The Requiem are all recommended for use with this product.